As the Salem Maritime Festival approaches, my anxiety increases. Whatever will those ‘gentlemen’ wear? Coats and waistcoats, and thank goodness I finished the Young Mr’s shirt and his farm trousers still fit. He has promised to be a very annoying runaway apprentice, and I have promised to chase him from the miilliners’ shop with a broom, but before any of that can happen, ‘gentlemen’ will need new waistcoats and coats. I got out Fitting and Proper, and took a look at that coatee pattern. It’s a little earlier than I want, so I also looked at The Cut of Men’s Clothes. In truth, I did not draft up a pattern from scratch. I had a commercially available pattern that I’d purchased when it first came out, one that purported to be historically correct, researched, and came from a reputable company. Well…so I guess the issue with the pattern is that the gentlemen in my household are not of the typically boxy build one may see streaming past tourist sites in Boston, or even lumbering across a field in historical uniforms. My gentlemen are built for the Light Infantry, so when I finished the first muslin (or toile) of the coat and fitted it to Mr S, I removed inches–yes, inches–of material along the side and center back. 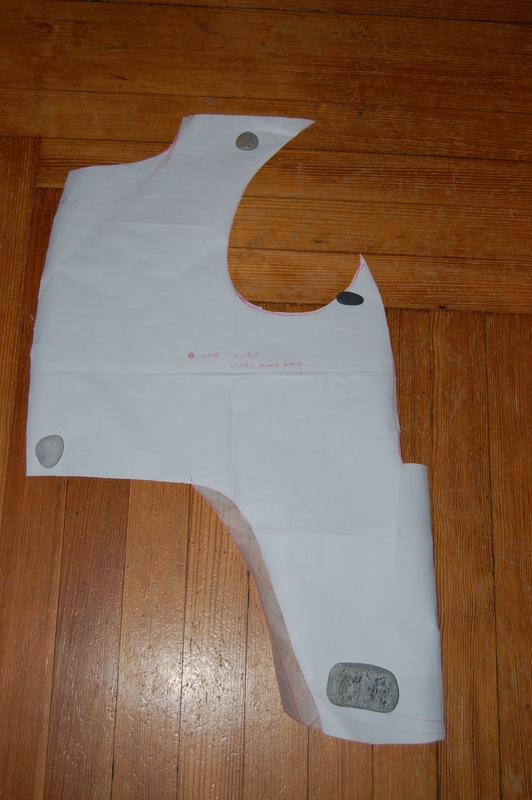 I suspected this would be necessary when I first traced the pattern pieces, but went ahead because you really have to mark up a toile on the body in question to get the fit correct. Maybe it’s just this many toiles because I’m inexperienced. In any case, the armscye and upper shoulder seam were re-drafted, the drape and sweep of the tails, the width of both side and center tails, the side seam of the body, and both seams on the center back piece, which originally had a flat center back seam (I ask you! 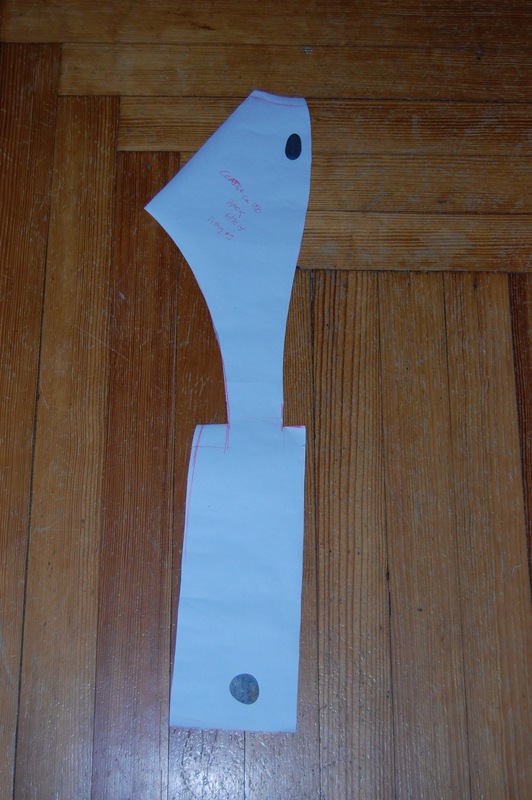 ), a shorter shoulder seam, and a different side seam. I’ve left the tail length short and after toile number 4, will mark the final tail length for both gentlemen (luckily we are at a sweet spot where this fits Mr S well and the Young Mr passably, so that with minor adjustments for the lad, a second coat could be made at some time). I still don’t believe the tail pleats entirely, but lack the time this week to draw them from an original. They still seem too wide, though I have taken an inch or more off every tail edge. 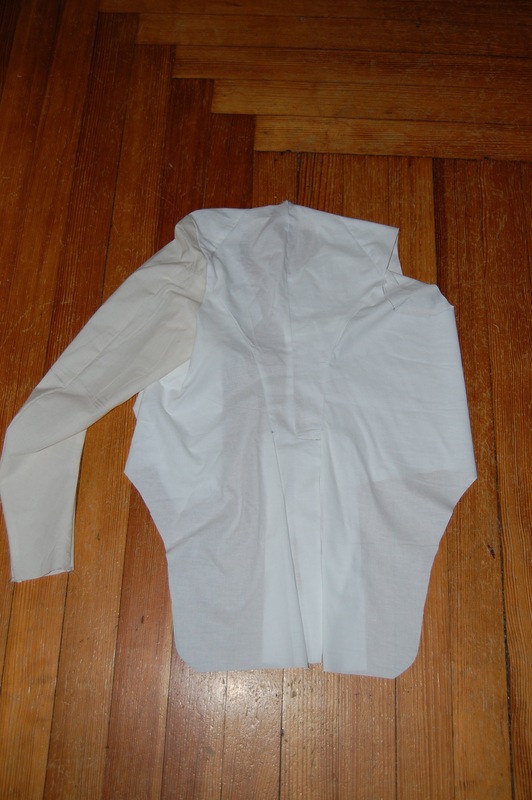 The last thing to really wrangle, after bringing the under arm seam back up, is the sleeve; the upper arm is too long, reflecting the fact that the basis for this sleeve is my Spencer sleeve, which traces its origin to Mr Cooke’s linen suit coat pattern. Both Mr S and the Young Mr have shorter humeri and femora, which put the elbow crook on their forearms which looked rather silly and uncomfortable. In the end, the pattern I had proved useful only in saving me from the math of enlarging a pattern from a book– it got me full-scale immediately, so that I could proceed to fitting–but this project will, when it finished, reflect multiple fittings and four pattern drafts. If there is a moral to this story, it is this: Almost nothing will fit straight out of the book or the envelope, so leave plenty of time for catching your subject and fitting muslins. Another moral may be, “Buy muslin in bulk,” which I did thanks to a clearance sale. I’ve already used 2 yards off the bolt I bought Saturday afternoon. FOUR?? FOUR TOILES!!! Is this woman patient, or WHAT??? Seriously, hooray for you. Since reading your blog I have looked very critically at what the Revolutionary war guys are wearing in those reenactment photos (not your events, of course) and have found them wanting. By a mile! Keep up the good work and I can’t wait to see the coats, waistcoats and whatever else you are sending your men out in!! Nancy, I didn’t think the word was patient! But not only will these be seen by some very experienced and sophisticated eyes, I really want them as right as they can be both in style and fit. Cutting into fabric of which there is no more in the world, or cost $60/yard, with some kind of confidence, is worth every toile. Whoosais to you, madame! I will have to provide you with a copy of Messrs Queen and Lapsley published in Philadelphia in 1804. It is a source of wisdom, pattern shapes and useful advice that will help make your next foray a bit easier. Henry, that sounds very interesting indeed. Mens’ clothing construction is so different from women’s’ in this period– I do feel like I’m trying to build a suspension bridge with garden shed skills. One thing to be said for the blue silk coat in F&P, it wouldn’t have been too big! Sharon, too true! I’m still not thrilled with the fronts, and I might also borrow the F&P sleeves. Mine were incorrectly proportioned and too tight.